This poem captures the essence of our experience at Azurmendi. Whether we choose a Michelin or a World’s 50 Best restaurant, or in this case, a restaurant like Azurmendi that appears on both lists, we know with a level of certainty that we will thoroughly enjoy the food. The only wild card with a Michelin rated restaurant will be how we are made to feel about ourselves while dining. 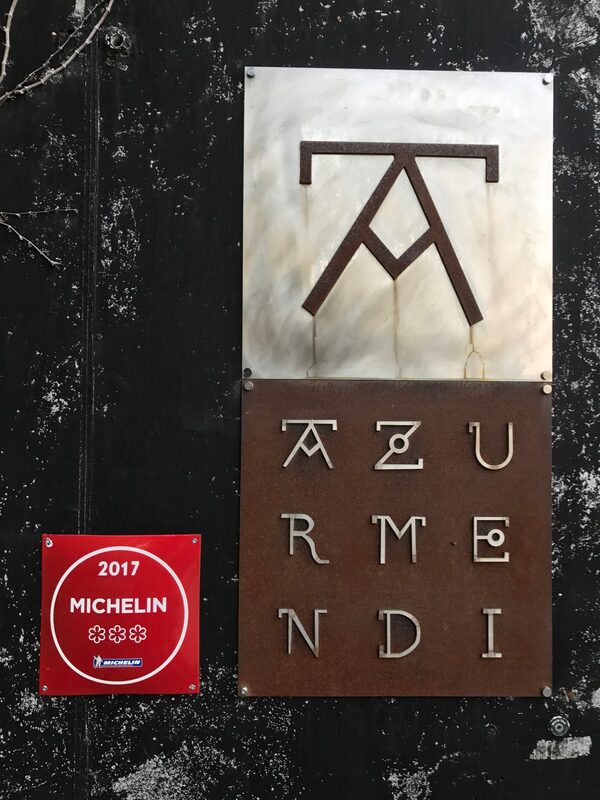 It’s the intangibles, reading the air around the occasion that is fundamentally different (for us) between Michelin & World’s 50 Best. We do not mean to sound negative about Michelin, we love the list, we use it often to make decisions and are generally very happy with the recommendations. We are not stuffy people is my only point. We do not like to be treated like we are important as we do not think of ourselves in these terms. We’re a couple of cheeseballs who are crazy love with each other and life and we simply like outstanding food! The core difference in the restaurant lists (to us) has to do with ambience and how we will be made to feel at dinner. We’ve noticed a trend of Michelin restaurants (especially three star) working to conjure the feelings of “self-importance and rigidity” in guests while the World’s 50 Best restaurants work to put guests “in a relaxed state of awe.” Two very different vibes and we much prefer the playful, informality of the latter – “relaxed yet classy white table cloth” if you will. The Woodward’s only prerequisite is first and foremost delicious food and secondly, we want to be in awe of the talent in a playful, welcoming environment. It’s truly that simple. 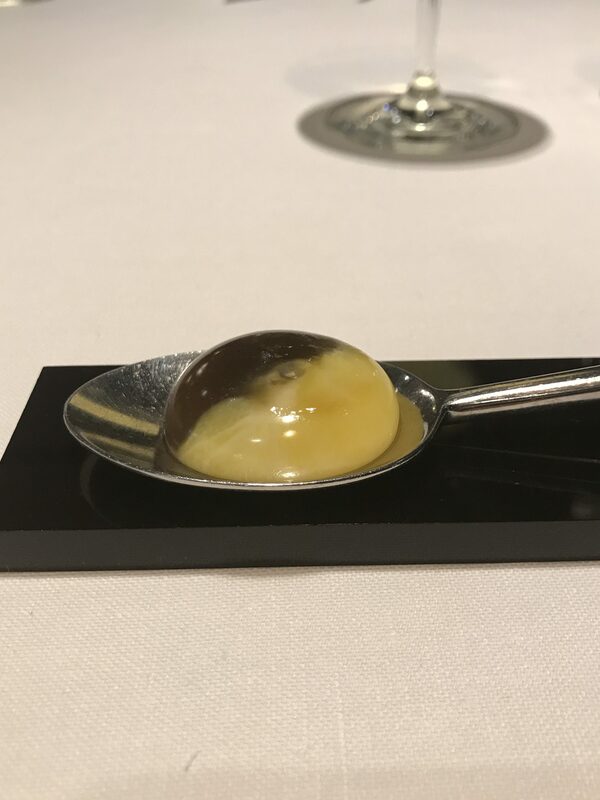 For a three-star Michelin restaurant also on the W50B list, Azurmendi (thankfully) was just the perfect balance of all the above. Not pretentious, not stuffy, entirely beautiful every step of the way. 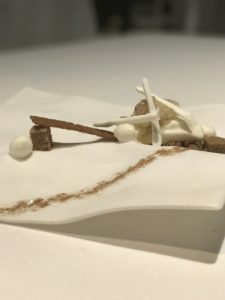 This is the gold standard where fine dining is concerned and we do believe this new convention of ‘relaxed over rigid’ and ‘quality over elitist’ is the future we have to look forward to when utilizing both or either restaurant list (thanks in large part to the next generation of diners and chefs, The Millennials). Ahead of our visit, Chef Eneko reached out and personally invited us to dine at his restaurant in Larrabetzu, Spain. 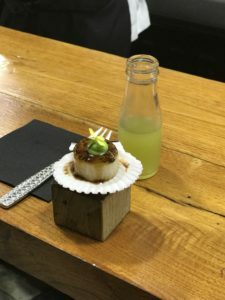 Without hesitation, we took him up on his invitation, but given our travel schedule and other obligations, we could only visit during the time Chef would be away opening his new concept in Tokyo. (If you aren’t familiar, take a peruse of Eneko London here and Eneko Tokyo here). 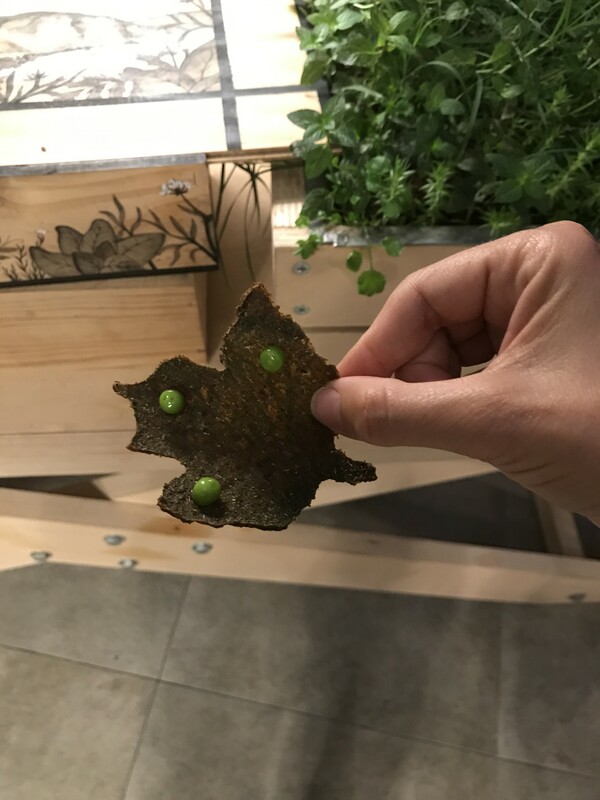 We arrived at 7:45 pm for an 8:30 seating and walked around the gorgeous property catching the sunset, strolling through the garden and down the steep staircase that connects Restaurant Eneko (the former Azurmendi) space to the new Azurmendi space. Watching the sunset over the lush, green Larrabetzu foothills was breathtaking. The night in its entirety was a fairytale from the moment we drove up the winding road and the scenery spilled out before us, to the moment we pulled away several hours later under the starry-1:00 am-sky. Below we would like to share a few highlights from the three Michelin star meal, Number 38 World’s Best Restaurant for 2017. It’s a top experience of all time for us, a truly magical occasion. Azurmendi is authentic feng shui dining, a style that promotes a harmonious flow of nourishing, soulful energy. You don’t realize until later that the first stop in the garden is to align intentions becoming one with the environment while mentally preparing for the journey ahead. 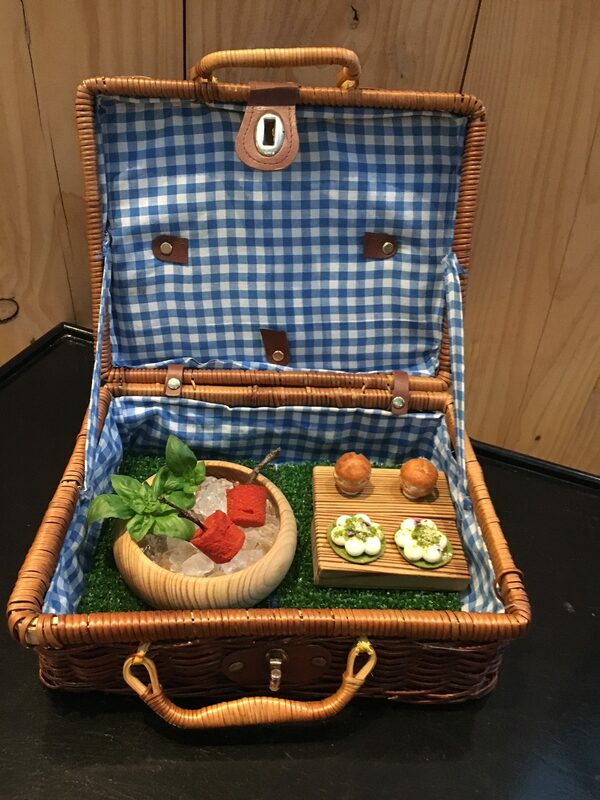 The occasion begins with a picnic basket. Etxano Cheesecake ~ rich and creamy. Smoked eel sandwich ~ quite tasty. frozen tomato lollipop ~ electric to the tastebuds! Until this had arrived, we had never considered tomato flavored ice cream as potentially appetizing popsicles, but the flavor was so electric on the tongue, that now we crave tomato ice cream and are wondering where we can find it or perhaps make it at home, if that’s even feasible. The wooden cutting board in the basket offered open face cheese cake that was rich and creamy and an eel muffin that was quite tasty. All three of these little treats sent us into orbit! Next we were escorted into the kitchen greeted with a warm Basque welcome and introduced to the chefs (quite a few of them working in harmony, buzzing about) while we enjoyed a small bite and bit of spiced Txakoli (pronounced like: cho-co-lee). Marine turnip with herbs emulsion ~ warm and delicious. Sea Txakoli ~ lovely aromatic! Through the kitchen we went into a lush greenhouse adorned with what appeared to be a bonsai arrangement in the center of the room and strategic pots of plants, herbs, flowers and greens outlining the glass room. This took me (Erin) back to my days on the farm growing up with my grandparent’s garden, the neighborhood kids and I would pick raspberries straight off the bush and we’d get lost in the rows of corn. All the produce was so fresh, we could nibble right off the stems. A memory I hadn’t doted on for many years until now -simpler times came rushing back and my eyes welled with love. A magic moment in the greenhouse of Azurmendi for certain. ‘Herb Leaf’ thin, slightly sticky like a fruit rollup. pantry spices, woodsy. ‘World’s Spices Cornetto’ – tiny little flavor punch. Fermented apple juice ~ refreshing. World’s spices cornetto ~ tiny little flavor punch! 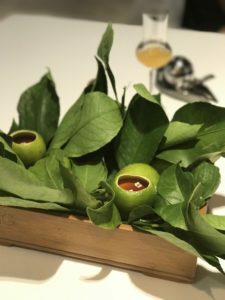 Herbs leaf ~ reminded us of the hibiscus at Minibar in Washington D.C.
Kaipiritxo ~ mini explosion in the mouth! Each of these treats made us erupt with mouthwatering joy! How did they pack so much flavor into such small bites? We made our way through this greenhouse room in a counterclockwise fashion nibbling out of the plants ending at the door that opened to the main dining room formally known as ‘the balcony’ of Azurmendi. When we reached the dining room, the Maître d’ welcomed us with a handwritten note from Chef Eneko. 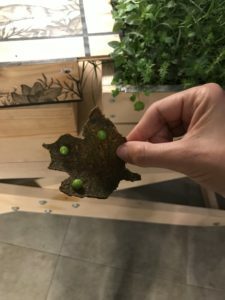 The paper of the note containing seeds with chef’s note asking us to plant the entire card to signify new beginnings like the beginning of our friendship with Eneko. We were so touched by this! Very soon we will buy potting soil and plant the note. The gorgeous meal continued in the main dining room behind a wall of glass, but sadly the sun had set and the tops of the trees were no longer visible. The gorgeous country side became a mirror reflecting our own activities inside the dining room. Our activities were limited. We couldn’t touch at all during this meal. We were so far apart, it felt like an ocean. We prefer to hold hands, nuzzle, kiss, touch throughout our meal and with the arrangement here, it was not possible. That’s one key element of our tasting menus, we must be able to make physical contact with each other! When the reservations team asks if we have food allergies, we say no, but if we are going to be seated far apart for 3.5 hours (the time it takes to eat), we will need to arrange the table differently. We must be able to touch at the dinner and steal kisses between courses, or life becomes a little less magical! The good news is that the food was amazing enough to take our mind off the fact we were seated so far apart! It was a lovely evening all the same and now we know how to arrange our chairs for next time. Limon Grass Vermouth ~ To-die-for favorite described below! Farm’s Egg cooked inside out and truffled ~ delicious! Oyster, apple frost and seaweed traces ~ interesting & surprising. Prawn tartar, emulsion, air and their heads juice ~ oceanic. Local tomatoes, gel and basil sorbet – delicious! Garlic Mushrooms ~ outstanding described below! Slightly spicy pork and basil ~ savory and herbal. Roasted Lobster, out of the shell, crunchy and its mayonnaise – tender! Red Mullet, wheat stew, pepper, parsley potatoes ~ smoky & fantastic! Glazed Castañeta, green peppers and ham bite – saliva gland of the pig. The most amazing course of the night by far was the ‘Limon Grass and Vermouth‘ – the dish that rocked our world. Hallowed lime rind bearing creamy foie gras (like mousse). We oohed and ahhed as we scraped every velvety spoonful from the rind. As we devoured the contents of the lime, the staff was observing how we handled our utensils and what happened next was just magical! As the next dish, ‘Farm’s Egg cooked inside out and truffled‘ was being placed on the table, our lovely maître d‘ approached and inquired “Madame, are you left handed?” I nodded to confirm, “yes, I am.” He immediately reached down and rearranged the place setting switching the dish around to make it accessible by my dominant hand. I was so impressed, what a charming and observant move! I’ve NEVER had anyone notice this before and amend for my comfort. Once again, we were both in awe! ‘Farm’s Egg’ cooked inside out and truffled. Maître d’ noticed & rearranged place setting for left-handed dining. Savory ‘Garlic Mushroom’ pasta & fried egg | favorite of the evening. Our appetites were so satisfied by course 17 that we were barely able to finish the last three mains in their entirety. I began to eat only 2-3 bites of each dish saving room for upcoming platings and this worried the server. Rest assured, we were just getting sleepy and full from how well we were being nourished. The portions are extremely generous at Azurmendi. You will leave full. Just when we thought we didn’t have any more room, the first bite of passion fruit that hit our lips perked us right up opening up space for our fierce, collective sweet tooth. Our server recommended a dessert wine to round out the night, which ended up being a wonderful recommendation. In particular, the sip with the ‘Black olive, sheep’s milk, cocoa‘ dessert was the most outstanding thing we’ve ever tasted. Our conversation quickly turned to moans and groans of sheer delight. Yogurt, honey and five spices ~ like nibbling the foothills of Larrabetzu! Black olive, sheep milk, cocoa ~ best dessert we’ve ever had! Petit fours ~ lollipops, gummies, truffles served in a wooden box. Best Dessert of all time: ‘Black Olive, sheep milk and cocoa’ | absolutely rocked our world!!! 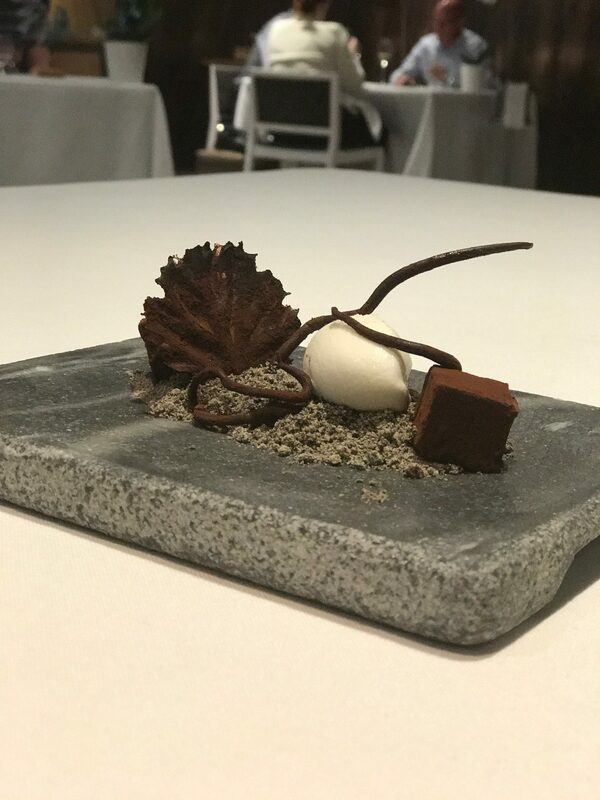 The Black Olive dessert tasted like chilled black olive dust with a side of ice cream and gritty cocoa. The temperature, consistency and flavor combination was entirely gorgeous. The last treat that arrived was a wooden box of petit fours with a white-chocolate-basil lollipop catching us off guard with a unique blend of flavors and cake-like texture (video here on Instagram). A flawless evening! Our experience didn’t end with dinner service. Chef Iker Arando graciously gave us a tour of the grounds of Azurmendi (seed room & greenhouse) as well as Eneko (the secret lab, winery and wedding concept) explaining the history and progression of both restaurants and how ideas continue to be born for Eneko’s concepts around the world ~ Spain, U.K. & Japan. Chef is in the midst of building quite an empire. Changing Scenes as the New Norm? Changing scenes seems to be a new approach in fine dining. Enigma does this five times (six rooms), Azurmendi did this three times (four rooms). Nerua did this once (two rooms). Changing locations adds elements of “interesting” and “suspenseful” to the evening and also the physical movement aids with digestion and overall comfort. The entire occasion was a fairytale. Most every bite was outstanding. There were peaks on top of peaks on the menu but then by course 17, we became full, sleepy and a bit sad (saying this in jest) from not being able to touch each other and steal kisses between courses. We changed locations three times ending up in four completely different parts of the restaurant. 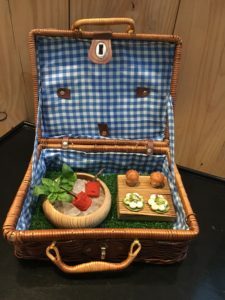 Thankfully we could make contact in the garden while enjoying our picnic and in the greenhouse we held hands as we picked a few courses fresh off the stems. 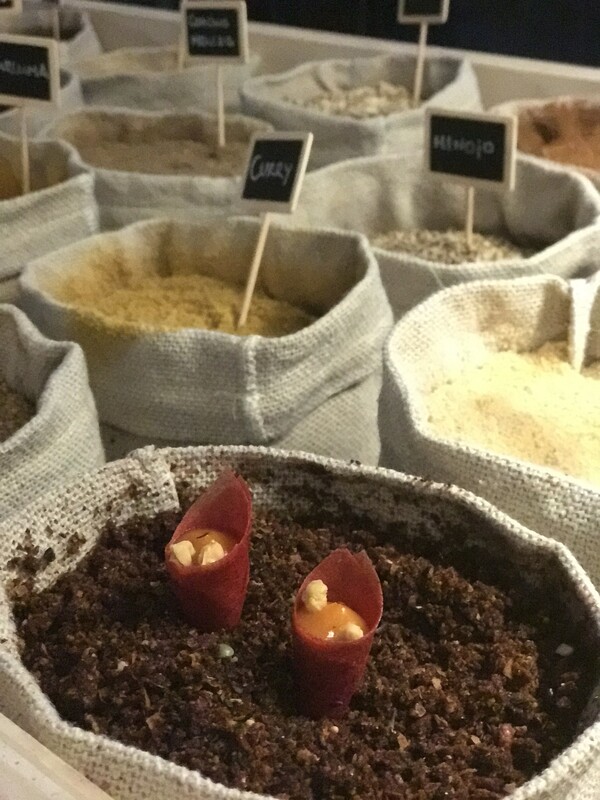 We have embraced scene changes as a wonderful addition to a tasting menu. Azurmendi is more than fine dining, it is a journey in sustainability with a great deal of emphasis placed on the environment. The restaurant replenishes crops year over year. Rainwater is collected and irrigates the on-site garden via a massive retainer on the green roof. An on-site greenhouse is irrigated with rainwater along with the wash room facilities working off of rain water. Geothermal energy is used throughout. The fairytale at Azurmendi is about nourishment. Eneko nourishes his guests, nourishes the earth and nourishes relationships. It’s quite inspiring to meet business owners and chefs who put the long-term greater good at the core of their business model while at the same time serving up delicious food. We look forward to returning to Bilbao in June of 2018 for the World’s 50 Best Awards Ceremony and will make it a point to pick a day that Chef is actually working at the restaurant so we can give him a much deserved hug (from Erin) and firm handshake (from Brandon) for arranging such a divine experience while he was away. For more information and Azurmendi reservations click here. Download our e-book! We share our secrets for traveling the world and eating famous without breaking the bank. Bravo! How interesting that we had a few different courses than you just days apart! I like that the tasting menu can ebb and flow, unlike at other restaurants. I agree with you that Azurmendi is a fairly tale! From the rooms, to the food, to the service, everything was picture perfect. Hope to return!!! Yes, really interesting flavors that kept us hitting highs course after course, not to mention the splendid grounds and various scene changes throughout the experience. Really divine tasting menu and we will definitely be back. Glad you enjoyed. Looking forward to reading your thoughts as well. Thanks for stopping by! By the way, I’m a southpaw as well. Always nice to meet another one! 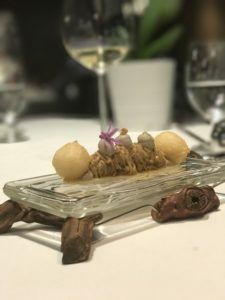 I came across your Azurmendi – Memoirs website and I LOVE IT!